Prophets Ishmael and Isaac are the sons of Prophet Abraham. They, along with their father, form the link between the world’s three major monotheistic religions, Islam, Christianity and Judaism. Together these religions are often referred to as the Abrahamic faiths. 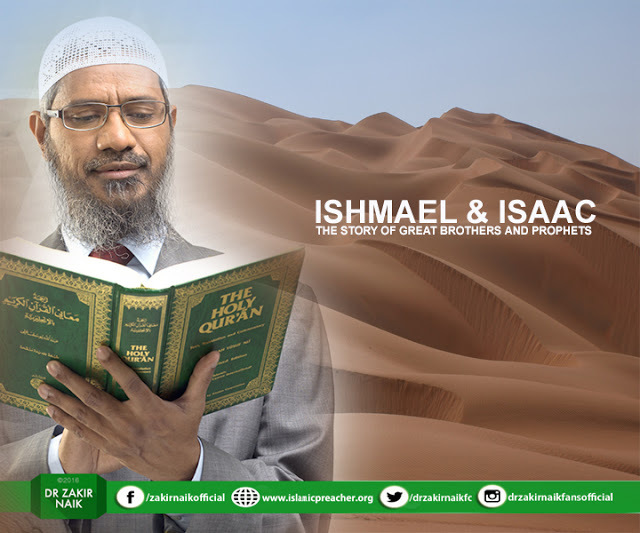 Ishmael is identified as the father of the Arabs, an ancestor of Prophet Muhammad, and his half-brother Isaac is the ancestor of both Prophet Moses and Prophet Jesus. The stories of these two great founding fathers, Ishmael and Isaac are remarkably similar in both Islam and in the Judeo-Christian traditions. However, having said that, significant differences exist. Prophet Abraham’s willingness to sacrifice his son for his faith is the story that looms large in the religious consciousness of Muslims, Christians, and Jews. The biblical story of Abraham’s sacrifice is told in the Old Testament, in the 22nd Chapter of Genesis. God tests Abraham by instructing him to “take your son, your only son Isaac, whom you love” to a mountain where he will be slayed, burned, and offered to God. On the journey, Isaac wonders about the purpose of the kindling wood and is told that God will provide a lamb to be sacrificed. Then he is tied to the wood and his father raises the knife. At that moment an angel tells Prophet Abraham to stop and that he can slaughter a ram instead. In the Quran, the name of the child is not mentioned, but other Islamic traditions tell us distinctly that the child to be slaughtered is Ishmael. Islamic scholars also stress that Ishmael understood and was willing to comply with God’s commandment. The Prophets of Islam are revered figures, and Prophets Ishmael and Isaac are not exceptions to this rule. However, the Quran actually tells us very little about the details of their lives except in reference to their significant and influential father Abraham. In both versions of the story of the brothers, Ishmael is acknowledged as the older brother but curiously the Bible calls Isaac Abraham’s only son. This is probably because Ishmael is the son of Hajar, known as the handmaiden or servant of Sarah, Abraham’s wife. In the Quran, we are told that Hajar is married to Abraham before she bears him a child. Righteous Prophets would never take advantage of a servant, their morality is beyond reproach. This is where the differences in the Islamic and Biblical stories often arise. The Quran takes Biblical figures and retells their stories in a new way. They are reimagined. In both sources, the time lines involving Ishmael and Isaac are very different. In Biblical sources Hajar, the servant, is sent away because of some unexplained interaction between Ishmael, acknowledged as an older child, and the very young Isaac. They wander alone in the desert until Hajar fears that her son will die of heat exhaustion and dehydration. She cries out her fears to God and He provides a well in order for them to quench their thirst. Islamic traditions tell us that Prophet Abraham was ordered by God to take his wife Hajar and baby son Ishmael into the desert. He leaves them at the place that would eventually become Makkah. Hajar, at first unable to understand why Abraham would do this, realizes it is the will of God and accepts their fate. However, she still struggles and fears for the life of her baby. Hajar lays Ishmael in the shade while she runs between two small hills looking for help. She begs God for mercy and He sends it in the form of the angel Gabriel who tells her to lift up her baby. When she does so, she notices that his feet have scratched the ground allowing a spring of water to bubble up to the surface. This is the well of Zam Zam and their ordeal is commemorated in the Hajj rituals Muslims perform today. The Biblical traditions tell us very little about Ishmael’s life except that God was with him; he dwelt in the desert and was an archer. He is not known as a Prophet but acknowledged as the father of many nations. On the other hand, Islamic sources tell us that Abraham, far from abandoning his little family, visited them often; playing a major role in choosing Ishmael’s wife and working with his son to build the Ka’bah – the cube shaped building in Makkah known as the House of God. The Quran tells us that Ishmael was a Prophet and a Messenger. Isaac is considered a Prophet of God in all three Abrahamic faiths. Muslims respect and honor Prophet Isaac, as they do all the Prophets of God. They believe that both Isaac and his older half-brother Ishmael continued their father’s legacy by preaching the message of One God. The Quran mentions Isaac more than 10 times but does not give details of his life. Islamic scholars however agree with the many biblical traditions that tell us that Isaac was a spiritual man concerned about his progeny and anxious that his feuding sons Jacob and Esau end their conflict and live in a way sanctioned by God. Muslims believe in the Biblical stories only when they do not contradict or go against the Quran or the authentic traditions of Prophet Muhammad. From the beginning of Islamic history, there has been scholarly debate about the name of the child to be sacrificed by Prophet Abraham. It is interesting to note that the Quran does not mention a name as if to remind us that the name of the child is not the most important matter. What is important is what we learn from the narrative. The story of Abraham and his ones has a practical lesson for the people of that era and forever more. Child sacrifices were rituals that existed then and with this event God put a stop to it. Otherwise many might have assumed that sacrificial murder was accepted by the One True God. The most compelling lesson we learn from Prophets Ishmael and Isaac is that a true believer is willing to give up anything, or anyone, for the sake of pleasing God. Prophet Abraham showed that he was willing to follow the commands of God, so too did his son. Because of their efforts, Abraham became the father of many Prophets and great nations and the message of the One God spread far and wide. In addition to this, the stories of their lives show us that a life has no meaning or value except when it is used to please and worship God.